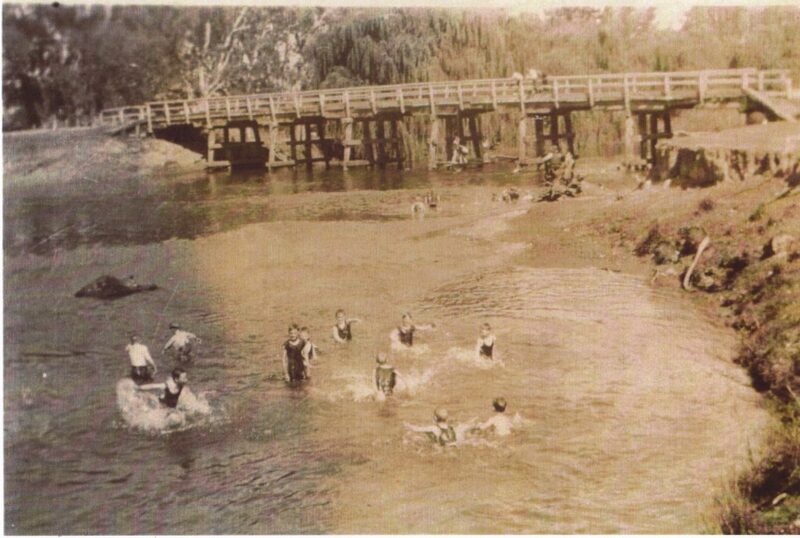 BEFORE the Wodonga swimming pool was opened in Stanley Street in December 1959, there was a part of Wodonga Creek which became a popular spot to cool off. It was reported: “He contended that there is an abundance of clean, wholesome water therein.” Further discussion is reported about the safety of the creek, having been the scene of fatalities in the past. The number of children to be catered for in Wodonga was at least 400. Albury children, with the advantage of their graduated baths, were four times as good swimmers as the Wodongaites. By 1934 a pontoon had been built in the Wodonga Creek for use by the swimming club. The Victorian Government Gazette, dated May 19, 1937, officially declared a reserve for public purposes along the anabranch of the Murray River in the town of Wodonga for a public swimming pool. This was a spot upstream of the Wodonga stockbridge, which was built in 1940. Swimming attire was to be very “proper” for anyone over the age of four, with leg length and body coverage exactly proscribed. Tony Conway, of Wodonga, remembers a diving board near the men’s changing shed, with the swimming area lit at night. Wodonga’s Reg Morley tells us that during the war the army was camped at the racecourse and used the swimming pool for recreation. One of their carpenters made a diving board of oregon, which was jammed into the rocks on the bank. This may be the board Tony remembers. Until the Stanley Street pool was opened all schools conducted their swimming carnivals in the Wodonga Creek swimming pool. The Wodonga Historical Society meets the first Tuesday of the month at the Wodonga Football Club rooms from 2pm. The society has an interesting collection of local artefacts on display in their rooms at 19 South Street, Wodonga. It is open on the first Sunday of each month from 1-4pm or by arrangement.